Wait, were you expecting a classic Mondrian piece with blocks of primary colors and bold, black grids? 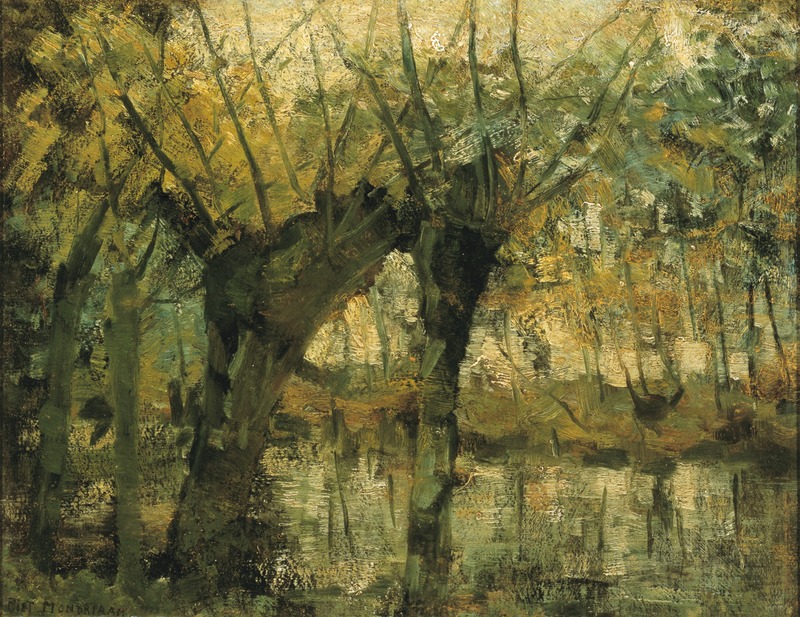 Before Mondrian made the abstract paintings that we all know and love, he was an aspiring Impressionist. Beginning in 1892, he turned away from the teaching career his parents forced him to by enrolling in classes, moving to Amsterdam, and joining the art society Kunstliefde, or “Art Lovers” in English. Most Dutch painters at the time did local landscapes and still lifes of the polders and meadows around them. It wasn’t until a trip to Belgium in 1903 that he began to break away from the Impressionist mold and move toward a more abstract style. Willow Grove was painted just two years after that move, and believe it or not, the branches and trunks throughout the piece served as foundation and inspiration for the black grids that would serve as the backbone for many of Mondrian’s grid work later on in life. Later landscape works showed more and more intertwining branches, beginning a taste for abstraction that would permeate the rest of his work. By 1907, the Post-Impressionists would leave a further drive in Mondrian, causing him to add vibrant color to his landscapes as they broke further away from reality. The previous owner of Willow Grove was James H. Clark, a computer scientist who founded Netscape, Silicon Graphics, and Shutterfly. He was an associate professor of electrical engineering at Stanford from 1979 to 1984. While there, he developed the Geometry Engine, the precursor to all modern day graphics processor units. He’s part of the reason you can run Red Dead Redemption 2, make 3D models in AutoCAD, and complain about bad CGI in the latest action movie you just watched. A biological sciences building was dedicated to him and completed in 2003. He was also a native Texan, born and raised. Go Cowboys! Jaffé, Hans L.C. 2018. “Piet Mondrian.” Encyclopædia Britannica. Encyclopædia Britannica, inc. February 28, 2018. https://www.britannica.com/biography/Piet-Mondrian. “James H. Clark.” 2018. Stanford School of Engineering. Stanford University. October 4, 2018. https://engineering.stanford.edu/about/heroes/james-clark. Myers, Nicole. 2017. “Willow Grove: Impression of Light and Shadow.” DMA Collection Online. Dallas Museum of Art. 2017. https://collections.dma.org/artwork/5242649. “The James H. Clark Center.” n.d. Clark Center | Welcome to Bio-X. Stanford University. Accessed November 30, 2018. https://biox.stanford.edu/about/clark-center.